Glucose, or blood sugar, is the source of energy for the human body. It is derived from the food we eat. The hormone insulin helps the cells of the body to convert glucose into fuel. Diabetes occurs when the body either does not make enough insulin or cannot sue what it already has. The result is the amount of sugar in the blood increasing beyond normal levels. A continuously raised blood sugar levels for long years result in a wide range of serious health problems. 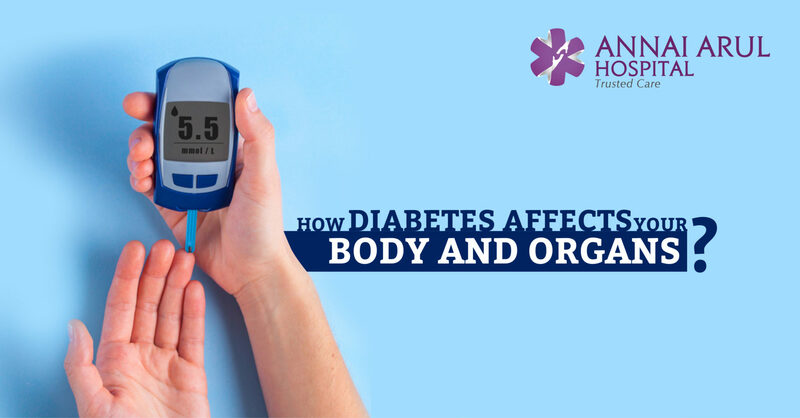 Now, let us look at some of the effects of diabetes on our body and organs in particular. Diabetes has a devastating effect on your blood vessels. It causes macrovascular disease and microvascular disease that affects the large blood vessels and small blood vessels respectively. Microvascular disease causes eye, kidney and nerve problems. Whereas macrovascular disease leads to heart attack and stroke. Higher level of blood sugar affects the elasticity of blood vessels and causes them to narrow, causing problems with blood flow. Thus diabetes is a big risk factor for heart disease, the risk for stroke or heart attack increases by 200-400 per cent for adults. People with diabetes develop neuropathy or nerve damage, this is because blood vessels do not deliver enough oxygen. The most common form is peripheral neuropathy, which affects toes, feet, legs and arms. Diabetes also damage blood vessels in the kidneys and prevents kidneys from functioning properly or filtering waste out of blood. Diabetes is the main cause of chronic kidney disease (CKD). Diabetes causes damage to retina and loss of sight mainly in patients over 40 years. Diabetes cases gastroparesis or slowness in movement of food to small intestine. The symptoms include nausea, vomiting, acid reflux, bloating, stomach pain and weight loss. The damage to blood vessels and autonomic nervous system interferes with the body’s ability to react to sexual stimuli and causes sexual dysfunction. Due to poor blood circulation people with diabetes have slower healing than normal. It also reduces immunity or interferes with the ability of white blood cells to fight infection. Diabetes affects all parts of the body including feet which if severely infected may need amputation; eye problems include blurred vision, reduced vision, blindness and cataracts; dry skin, skin tags, dark patches, bacterial and fungal infections and itching affects the skin; obesity and stress can aggravate in diabetics leading to severe heart problems. Fortunately, we can take a proactive approach to the diabetes and actually manage our sugar levels and maintain a normal level through medical care and few lifestyle changes. This helps to limit the effects.